The Cape of Good Hope was the first stamp-issuing entity to produce triangular stamps, beginning with its first issue of 1853. 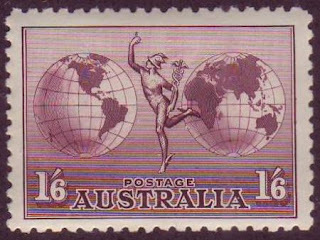 As with many early issues, printing quantities are not known for most of the Triangles, which include some of the great rarities of Philately. Despite the fact that there is some specialized interest in this area, including the collecting of varieties, "square pairs", and covers, the market for Cape of Good Hope Triangles (with the exception of the rarities) is somewhat cool, and one can often find sound, three-margin examples for 25%-35% of Scott, and F-VF appearing seconds at 6%-12%. Researching these stamps and forming a specialized collection of the relatively inexpensive ones could prove highly profitable in the long run. 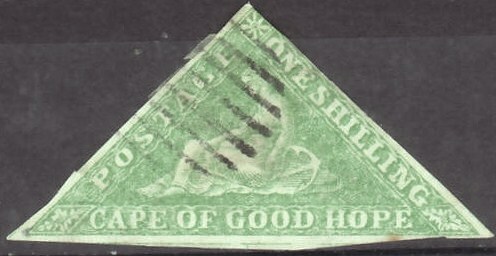 Stamps of the Cape of Good Hope have dual market appeal among collectors of both British Commonwealth and South Africa. While I like many of the Triangles, two that I favor for which the printing quantities are known are the 1863-64 6p Purple and 1sh Emerald (Scott #14 and 15), which had printings of 95,520 and 37,920, respectively, and Scott '10 values (as unused) of $ 275.00 and $ 475.00. A 1sh Pale Emerald shade (Scott #15a- Scott '10 CV = $ 1,200.-) is also known, and it's probably at least 3 or 4 times scarcer than the normal #15. South Africa is a country of vast potential. As a middle-income country of about 49 million, it has an abundant supply of resources, well-developed financial, legal, communications, energy, and transport sectors, a stock exchange that ranks among the top twenty in the world, and a modern infrastructure supporting an efficient distribution of goods to major urban centers throughout the entire region. South Africa is ranked 25th in the world in terms of GDP. Annual GDP growth has averaged about 4% over the past 5 years. It is likely that South Africa will be one of the fastest growing economies in the world over the next decades.